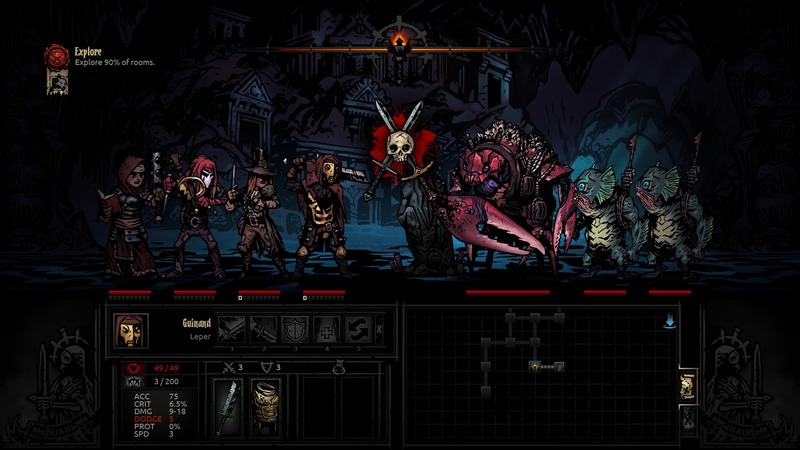 Just when you thought it was safe to return to the Darkest Dungeon, something like this happens. Then again, ‘safe’ isn’t exactly a word associated with this particular gruesomely difficult RPG-ish experience – in a good way, if that makes any sense. And hey, it’s only going to get better/worse (possibly both!) in this here upcoming expansion, The Color of Madness. Now, unfortunately, the above picture is not taken from The Color of Madness as I was unable to acquire any screenshots therefrom. It does – or should, at least – depict the game in its current form, even after all the updates and additions, though. As for what to expect from this $5 piece of DLC for a game that’s already overflowing with content, well, how about some new bosses and a wave-based survival mode? Pretty neat stuff eh? In case that’s not enough, mention is also made of a brand new enemy faction – “The Miller and his loyal workmen have become lifeless husks”. Oh boy. Smells like trouble to me, although in a game like this, that’s pretty much to be expected. ‘Abandon all hope, ye who enter here’, or some such. At least your slaughter(ing) will be accompanied by new tunes, ya know? As well as… “a bunch of other…maddening…stuff” that they, for some reason, are not ready and/or willing to share at this point. Intriguing. Darkest Dungeon: The Color Of Madness will be available on Steam from June 19th, carrying a $4.99 price tag. Other platforms, TBD.